Skunk2 is proud to introduce its Pro Series XP (Extra Pressure) Racing Valve Spring Kits for Honda’s B-series VTEC and K-series i-VTEC engines. Each kit includes Skunk2’s high-quality race-proven dual valve springs that are the result of nearly two decades of racing and engine building experience. “XP” features a higher seat pressure for turbocharged and extreme high RPM motors. This spring has a seat pressure of 100lbs at 1.600” for the K-Series and 93lbs at 1.320” for the B-Series engines while keeping the coil bind height for higher lift camshafts. 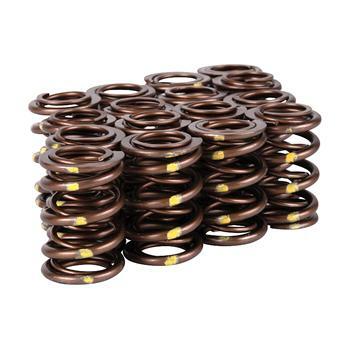 Pro Series XP Racing Valve Springs are engineered to handle the demands of extreme-lift camshafts operating at prolonged, high-rpm use at championship-level racing. Skunk2’s Pro Series XP Racing Valve Spring’s for Honda’s B-series VTEC and K-series i-VTEC engines are simply the best on the market. Pro Series XP Racing Valve Springs have been tested at speeds exceeding 11,000 rpm on our engine dyno, street, and the race track. Our superior, Japanese-milled, super-clean chrome silicone wire is 100-percent eddy-current inspected prior to coiling. Next, they are heat-treated, shot-peened, and chemically polished for strength and durability. A special nitriding process concludes Skunk2’s rigorous manufacturing process. The end result is a lightweight valve spring that safely accommodates high-lift camshafts and features superior resistance to load loss, even under extreme operating conditions.